Today marks the 100th anniversary of the battle of Jutland, the only major naval battle of the First World War. The engagement took place on 31 May 1916 in the Skagerrak, an arm of the North Sea, near the coast of Denmark’s Jutland Peninsula, and was fought between the British Grand Fleet, under the command of (Southampton born) Admiral Sir John Jellicoe, and the German High Sea Fleet, under the command of Vice-Admiral Reinhard Scheer. Immediately after the outbreak of the First World War, Britain established a successful naval blockade against Germany in the North Sea, denying German naval vessels access to the Atlantic. As the German naval force was insufficient to openly engage the superior British fleet, a plan was formed to lure out and destroy parts of the British fleet with the ultimate aim of punching a hole in the blockade. On 30 May 1916, British naval intelligence alerted Admiral Jellico that the German High Sea Fleet had left port and was heading north, to the Skagerrak. In response, Jellico ordered his fleet out to meet and engage the Germans at sea. The two main fleets encountered each other soon after and the full scale battle commenced. It raged on into the late evening with the British eventually gaining the advantage. Scheer then ordered the German fleet to withdraw only to be faced with a line of British ships which had been manoeuvred to cut them off. In the fighting that followed the German flagship Lutzow was sunk as was the British cruiser Invincible. The German fleet finally withdrew under the cover of darkness, bringing the battle to an indecisive end. Among the papers of Wilfred William Ashley, first Baron Mount Temple, is the above cited letter to Ashley’s second wife Muriel Emily (or “Molly”) from her first husband Commander Arthur Lionel Forbes-Sempill. 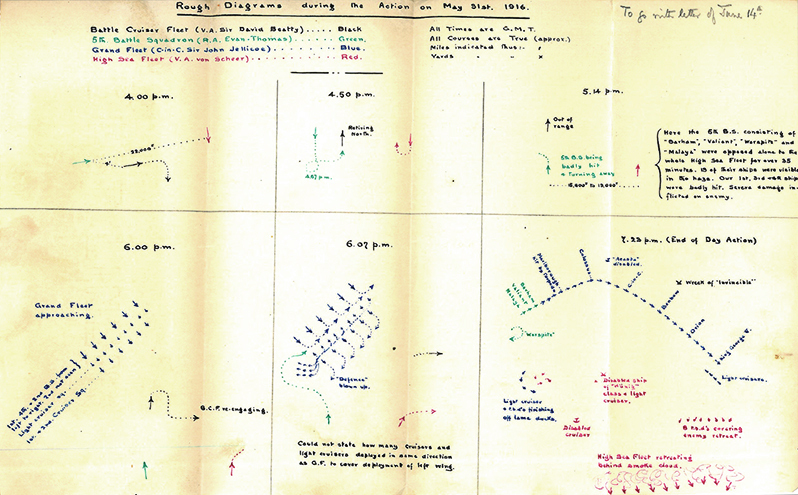 The letter, dated 14 June 1916, begins with him recalling a visit from a clairvoyant the previous December who foretells of the battle to come, stating: “I can see this great ship in the very thick of a battle, and I should say between April 26th and June 6th, because I see you surrounded with 6’s. […] You will, and she as well, come out of it untouched.” [MS 62 Broadlands Archives BR80/6]. Forbes-Sempill then proceeds to provide a first-hand account of the battle. 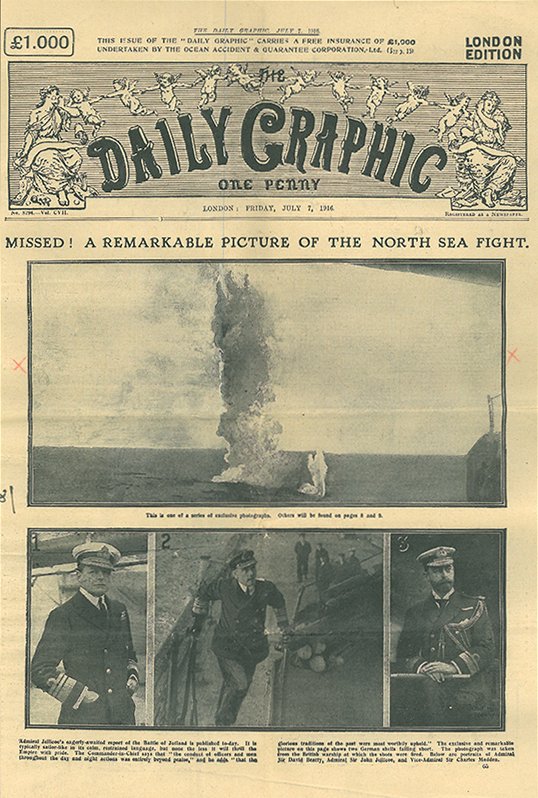 The letter is accompanied by copies of Admiral Jellicoe’s official despatch published in The Times and the Daily Graphic on 7 July, an account of the battle by an officer in one of the Queen Elizabeth class battleships published in the Daily Express on 19 June, together with Wilfred Ashley’s notes on the battle, including a breakdown of the action and lists of losses. Forbes-Sempill was recommended for promotion to Captain after the battle, being described as: “A very able executive officer, who had the arrangements for fire, repair and other parties extremely well organised and who was of great help throughout the action.” [ADM 1/8461/154] Given its indecisive conclusion, both sides claimed the battle as a victory. While, the Germans sank more ships and killed more sailors, the British maintained naval superiority and, as predicted by Forbes-Sempill, ensured the German fleet remained in port for the rest of the war. This allowed the blockade to continue – one of the key elements in the eventual Allied victory.